100 year old French cheese. I’m thankful thorns have roses. Jean-Baptiste Alphonse Karr dropped that doozie on us well over a hundred years ago. Perhaps a little Hallmarky in its tone now, but Karr, a French journalist and novelist, knew the power of a well-wrought thought. And perspective. If he were alive today chances are he’d dig the most ubiquitous of modern day statements of perspective: objects in mirror are closer than they appear. I like it. Of course, there are safety issues around having a skewed view while taking a corner at 80kmh, but chew on that rearview mirror wisdom for half a second. Could there be a truer statement about life? When is life not closer than it appears, more raw, more intense, more sad, more happy? And what are we supposed to do with this larger than life well, life? Remember the last time you had to practice diaphragmatic breathing just to go grocery shopping? Or the morning cleaning your room required a complete overhaul of your worldview? Time to be thankful again. That’s what Karr wanted. At The Feet Of Buddha Coconut. Lay aside for a moment the debate over whether it’s a fruit or a nut and this uber-object will quietly blow your melon. Food, fuel, drink and oil…the list goes on. The white meat can be rubbed on the skin as a moisturizer and mild sun block (SPF 5 seriously!). Polynesians and other advanced cultures did more than just make bikinis with the shells: they pounded the fibrous husk into clothing (exceptionally breathable in tropical climes). If one day you fall overboard it could be a coconut that saves your life due to its beach-ball buoyancy; a nifty design feature that helps it propagate its species, Cocos nucifera, over great bodies of water. Arguably the greatest use of the coconut was the employment of its shell to make the sound of horses’ hooves in the classic, Monty Python and The Holy Grail. You get the idea. It;s the rock star of fruit or nuts. For me, the coconut has always been a metaphor for infinite possibility and pure dynamism. Among the lessons the coconut has taught me, one rises above the others much like the coco cream rises and separates itself from the milk when left to stand. A coconut can be tossed into the Gobi desert and still produce a palm as green as unripe bananas! Why? Because it nourishes itself from within. Even under a scorching sun, even beneath a sky that promises no water and while resting on cracked earth determined to receive no roots, this divine seed still shoots toward heaven undeterred. In a fecund, organic firework display of joy and persistence it survives and thrives. I’m coco, watch me soar! John Donne said, ‘No man is an island’. He obviously never met a coconut. In the 6th century B.C., an old man with a beard like a thin waterfall tried to cross the border out of the Honan province in China to die in the desert. A border guard recognized the man as the great philosopher Lao Tsu. Convincing Lao Tsu to write down his enigmatic yet somehow infinitely lucid thoughts before he disappeared, Lao Tsu penned the Tao Te Ching. Lao composed 81 chapters on the Tao, the natural law of all things. The chapters pose a rich challenge to those who wish to release their wisdom. But it cannot be forced, rather truth unpacks itself naturally, emanates easefully so long as you are attentive to it. Like scent diffuses from a flower. One line in chapter 15 always brings me joy. Lao describes the ancient masters as being, among other things, “hollow, like caves”. Is this a quality you recognize in great people? A stillness, empty-fullness? Check out chapter 15 and let me know what you think. Lately I’ve been coming home, after doing-good in some new locale, to a fridge full of expired edibles. Tomatoes as supple as sponge cake. Carrots shriveled, incapable of mustering a healthy *SNAP* when nibbled. Cheese, lovely just a few days before, now looking like the surface of some distant, asteroid pummeled moon. And the poor cilantro! If I wasn’t such a food freak, it probably wouldn’t bother me. But I adore food and perhaps more than the finished product, I love the ingredients. The other day I made my roommate pause his video game so we could marvel at what I figured was a perfect bell pepper. It’s walls were firm, the skin was a lustrous hot-coal-red and the stem was leaping out with green confidence, like a single shock of hair on a happy newborn. Dusty and sweet it smelled. We beheld the vegetable in awe. So it’s with a heavy heart I return home to find a lackluster pepper with sunken cheeks, shored-up in my crisper. I feel guilt. It’s like visiting a grandparent at the rest home and finding they’ve aged faster than you’d expected, that you missed them in their prime. That you were neglectful. And it’s true: humans do have a best-before date. Buts it’s a date that’s reset each time you make the effort to connect and show love. True friendships require constant kindnesses. It’s important to hold loved ones up, to admire them and marvel at your luck for having them in your life, for they are the ingredients of a truly happy life. What would our world it be like if we offered before we asked, gave before we took and helped before we demanded assistance? And what would it be like if we were to give without measuring? Many parts of our lives are still measured in checks and balances, filtered through the warped childhood-calculus of Even-Steven. How often have you felt justified borrowing a roommate’s jacket without asking because you KNOW they’re eating your food? Or perhaps you’re not returning a phone call because last week your call wasn’t returned promptly enough. You supply the example, there are certainly plenty. But there is one offering, one act of human kindness that we all struggle with. It’s really the granddaddy of all GIVES and the penultimate gobbling of humble pie: the apology. We drag our heels over the 5-letter S-word because we feel we are somehow losing something, that the math will be off. The books cooked. Consider this: an apology isn’t something a person takes from you, it is something you give. Indeed, its very power lies within its nature as a gift. Do you give a gift and expect one in return or do you give without measuring? Back in another could-be-anywhere airport. Anywhere is Chicago this morning. Last night our flight was delayed from Detroit which put us in Oprah-land too late to leave and so we spent the night here. I sat next to the coolest cat on the plane. When he wasn’t humorously grumbling for a JD on the rocks, he was curling my hair with stories of the 9/11 clean up in NYC. This guy, Rob, was in charge of coordinating and overseeing the clean up of the pile, the huge mass of debris that was left after the twin towers collapsed. It took two years to remove and for the first 6 months it’s molten core, still smoldering with jet-fuel, dioxins and other horrific things, sat around 1500 degrees Fahrenheit. He said he risked his life to serve his country and do his bit in the aftermath of that tragic event. When Rob told me he risked his life he was speaking to the dangers of simply being in such close, extended proximity to the heap of shattered scrapers. What most news reports wont tell you is that the burning pile of concrete and chemicals in the heart of Manhattan was toxic beyond comprehension. Now he has what is referred to by doctors as WTC cough, a respiratory condition caused by the inhalation of all the poisons that were off-gassing from the debris. Saddest of all, he now has leukemia which his physicians believe was caused by his daily exposure to the pile for months on end. This is all heavy stuff, obviously, but man did this guy wear it lightly! He said one of the perks of his job was he got to meet a ton of celebrities like Adam Sandler (a real character guy), Mike Myers, Oprah and starlets like Meg Ryan. Rob sounded pretty sweet on Meg after their meeting. At one point when our flight was delayed he phoned home and pretended to leave a message for Meg, apologizing that he’d be getting in late. Rob, I hope I see you again, but if I don’t please allow me to acknowledge your stupendous sense of humor and, of course, your courage. I just ate the anti-breakfast. A sugar-thick strawberry smoothie made crimson courtesy of red-dye number 38. And two egg-bacon-croissant-grease thingys wrapped in wax paper. If I left the paper on they might have gone down easier. We are leaving Orlando and yesterday was brilliant. We teamed up with SAS (a global software company) and visited the Altamonte Boys and Girls Club. The young kids coming into the facility after school legions of kindergarten small fry looked exhausted but we had them Coca Cola-hyper within 20 minutes. Some of the activities included making wind chimes out of sticks, plastic lids and jingle bells and banner painting. But the big hit was a kindness scavenger hunt. On their hunt to achieve oneness with do-goodism, the kids had to start their own kindness petition, write down a goal that was to be placed into a time capsule and compliment someone. When it was over, about a hundred kids and forty adults gathered around the time capsule and dropped it in the ground. Two hundred frantic little hands had it covered in 45 seconds. The odd kid, in a moment of over zealous capsule covering passion, fell into the hole and Erik and to quickly yank them out. All told, a blissful day. But the kids probably weren’t as pumped as the SAS folks who made the day possible. There were some tears on the bus as we headed back to the office, recounting stories and passing on kudos to all. Sitting in my Alaska Airlines seat at 30,000 feet, as I tap this out, everything is bright and shiny. Always is. Have you ever had that plunging sadness that seems to follow the plane when it returns to earth? No more fluffy clouds, no more infinite possibility, no more perspective? There’s a trick I know. May you all attain the super-sunny inner-state that volunteering always seems to bestow on those willing to fly its friendly skies. A little Finley Quaye in your inner ear helps, too. We’re off to North Carolina to spread the love! In the meantime, check out this picture of one seriously inspiring lady: she’s the A-OK Lady of the USA. She lives in Columbus Ohio and she’s just like us: connects with random people in the hopes of making their day! Nice work Susann! Mother nature has rolled over in her bed and is dreaming of trees the color sun-smudged pumpkins, red-rusty barns and zucchinis, unripe banana green. This is one of my favorite times of year, by far. The sun shines just as bright, but usually behind clouds. In these darker months, it’s easy for thoughts to drift more toward the melancholic. We are creatures of the light: vitamin D is integral to a well-balanced, happy-life diet. But less sunshine doesn’t mean things can’t be as radiant, or warm. We were just recently in Winnipeg in central Canada, speaking to some middle schools. You won’t find Winnipeggers in Hawaiian shirts this time of year and you needn’t bring any SPF 30 if you’re thinking of visiting for a day or two. These hardy, uber-kind prairie dwellers have all the excuses in the world to be as bitter as the wind chill. But they aren’t. Nope, each one is as perky as the taco bell Chihuahua. One man takes the cake though. Jose – the Mexican theme is accidental – works at a hotel in Winnipeg and I want to take a page from his book. When he hopped on my elevator going down I thought by the sheer force of his plus-sign attitude alone, the elevator would change direction. This guy put one serious smile on my face. Everyone he welcomed onto the elevator got the same engaging greeting and a how are you? Not just the knee-jerk how’s-it-going, we get a million times before lunch. Jose really wanted to know, and you felt it. I rode the elevator with him 4 or 5 times in three days. 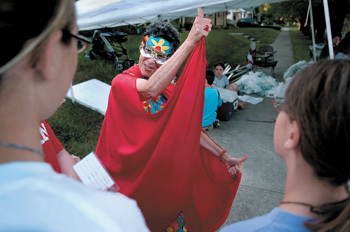 His generous sprit was infectious and his only agenda seemed to be kindness. Little acts of kindness on the extreme life-makeover elevator going up, up, up.